The wheels have been painted, the body has been hard coated and sanded umpteenth times, the decals have been laid out, the LEDs have been tested, the chassis has been fitted, and the last week of work arrived. 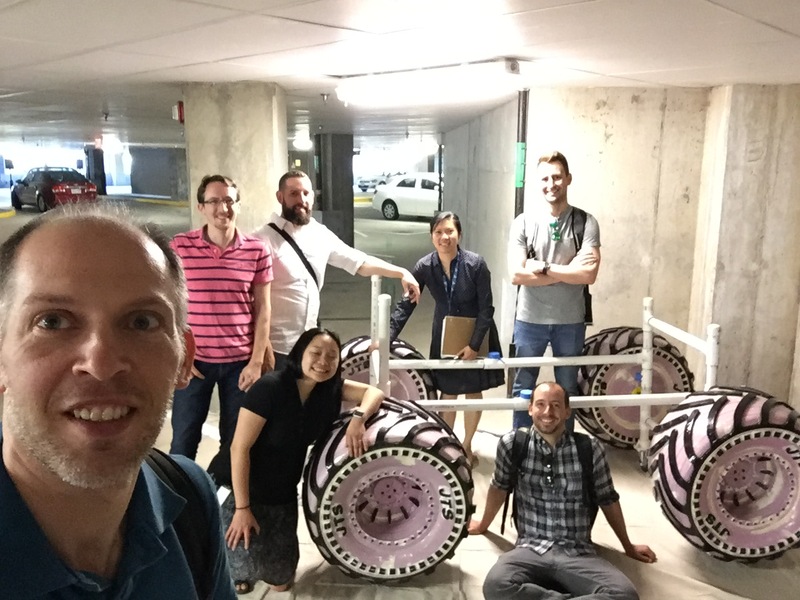 Yes, the SOLIDWORKS build team is finally seeing light at the end of the tunnel their monster truck costume has been racing through these past frantic weeks, and the closer they get to their end goal, the more excited and nervous they are. Any free time the build team has is spent in the Dassault Systèmes airplane hangar. There, they have done an unimaginable amount of hard coating, gluing, testing, and sanding (“My phone doesn’t recognize my fingerprints anymore,” said team member Jeff Turgeon. “I must have sanded them off.”). Hard coating, as a process, is easy to do on paper—it’s just a list of steps to follow to apply the coat evenly. But in reality, it’s a much more difficult process. 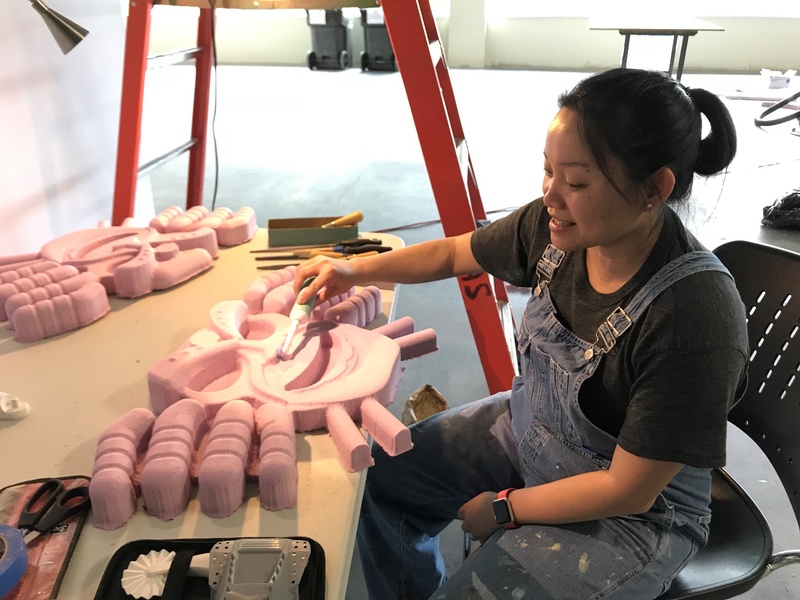 Annie has mastered the art of hard coating, but it’s still a process that involves precision in thickness, and then once the coat is applied you have to know how to sand so you don’t ruin details. Speaking of details, the face of the mini-Max-D is one of, if not the, most detailed pieces on the costume. The original idea was to sand it with a Dremel, but none of the Dremel’s in the lab were right for the intricate sanding that needed to be done. So Chinloo brought in her electric toothbrush! A piece of sandpaper was attached to the toothbrush head, and the mini-Max-D faces were brushed/sanded to perfection with a simple hack. The team has actually used a lot of hacks in their build. When the for the chassis switched from 3 wheels to 4 wheels, the way the weight of the attached pieces fell on the PVC pipes had to be taken into account. The way you design something in a 3D simulation doesn’t necessary reflect how it will come out in real life, where gravity exists, and the team could only add so many T-pipes and crossbars for stability. Soon, there was no room left on the chassis for more crossbars and T’s to be added. So Annie, Rob, and Sal decided to repurpose another piece that was being added to the chassis: the aluminum U-channels. The U-channels were being used to hold up the acrylic pieces that would be attached to the costume, and now they have another purpose. U-channels will be used as a cross brace to stabilize two of chassis sides as more costume parts are added on. Stability is good for a lot of reasons, and that stability was tested when Jonah had his costume’s dry fit! On the last Wednesday in May, Chinloo, Sal, Albert, and Rob traveled down to Jonah’s home to test the costume in person. While his younger siblings played in the yard, Jonah finally got to put part of his costume on. 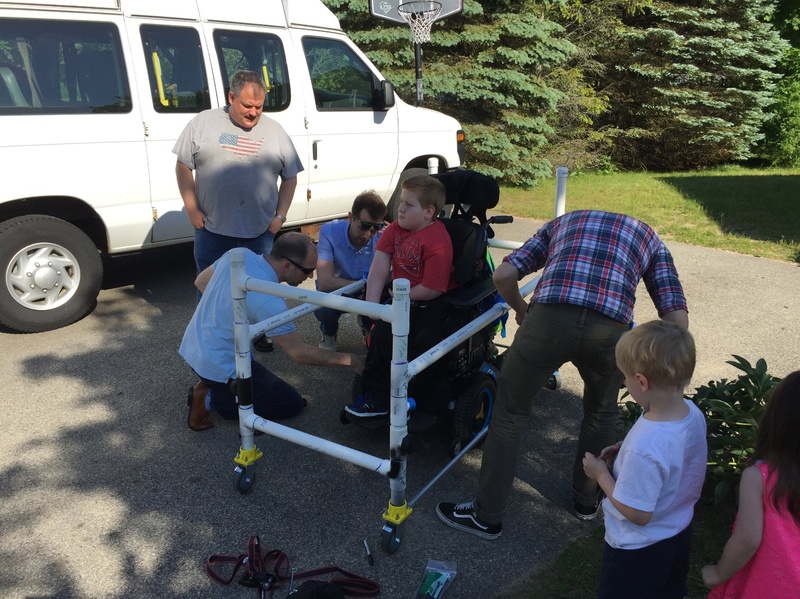 His wheelchair has eyehooks, normally used for stability in a moving vehicle, and the team was able to attach the chassis to the wheelchair. It worked beautifully! 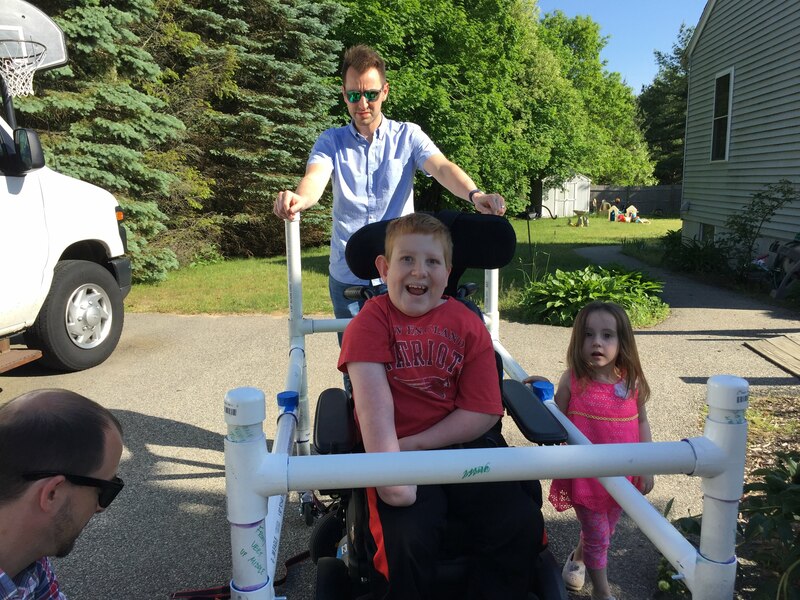 Jonah was able to reach his chair’s max speed of six miles per hour and brake with the chassis attached, no problem. Jonah was over the moon; he was even able to take his chassis off-roading into his grassy backyard, rolling over rough terrain like a real monster truck. There was no lag, no rattling, no wobbling, the chassis stayed together perfectly—everything the team wanted. “I was like, “Whew, thank God!” laughed Rob. The only hiccup during the dry fit was the right bar of the chassis hitting Jonah’s hand as he turned. There was some scrambling among the team members present about how to fix the issue—should they add a piece of foam to cushion his arm? Should they take Jonah off center so his arm isn’t so close to the pipe? Then Sal had a simple, perfect idea. He asked Jonah is his seat could move up and down. Jonah moved his seat up by half an inch and the bar was cleared. With new measurements of Jonah’s eyesight and height, the team will have rethink their plans for attaching the truck body to the chassis. Fortunately, it’s not a huge concern; they have options. When building the casters, they created ½ inch shims, and they can add two shims underneath each caster on the chassis to give it extra height. They also have some wiggle room with the size of the truck body itself. The truck body already sits a little high and the original plan was to drill holes into it so it would sit lower on the chassis. With the change in Jonah’s seat height, they may not have to drill the holes and can just glue the body to the chassis’ PVC caps. There’s still so much to do. Detail painting on the wheels, painting the body, fitting the body on the frame, all the electronics, LEDs, and wiring, and still more sanding and hard coats. But even with all the work before them, the team is feeling good. Nervous, but still optimistic about finishing on time and giving Jonah the most incredible monster truck costume any kid has ever seen. The day this blog posts will be one day before Monster Jam, where the SOLIDWORKS build team is going to reveal Jonah’s completed costume to him for the first time. He doesn’t know that his costume will be complete by then—Jonah still thinks he’s getting this costume for Halloween. He thinks this is just a normal, fun family time at Monster Jam (hopefully he hasn’t been reading this series!). 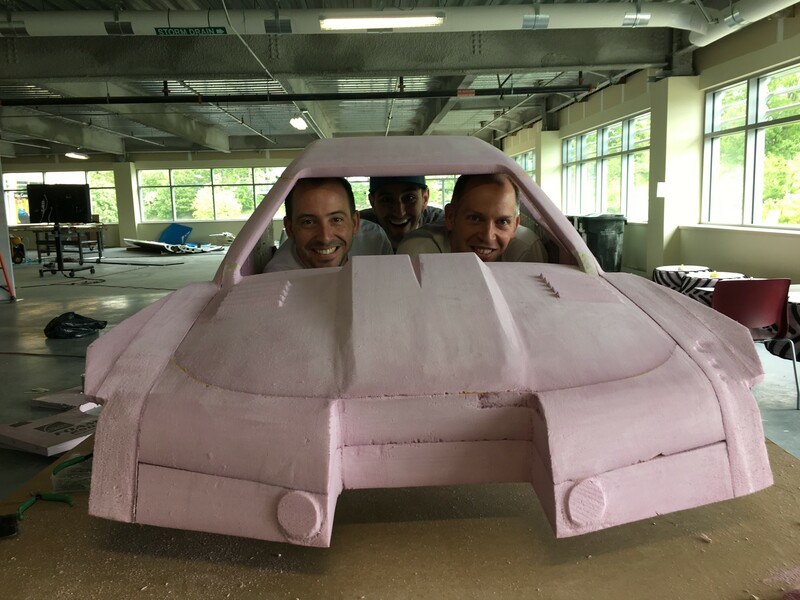 At the time of writing, there is little more than a week left to build the mini-Max-D, and the team is chomping at the bit to finish up their epic creation. Will they make it in time? Will Jonah have the experience of a life time? We’ll find out tomorrow and we’ll all keep on (monster) truckin’! Read about Jonah’s costume from the beginning!